It’s a drought year, right? But back in April, Pueblo Reservoir in southeastern Colorado was so full of water it came within days of releasing the excess, also known as “spilling,” to make room for spring runoff. Spilling water is painful in a semi-arid state, in part because whomever owns the water can no longer claim it for use. It simply becomes part of the river’s native flow, meaning anyone downstream could capture it. That’s a worst-case scenario for those accustomed to holding on to every drop. “It made it an interesting year to begin with because we said ‘How could we have such a dry year and still be faced with having to spill water?’” says Garrett Markus, water resources engineer for the Southeastern Colorado Water Conservancy District, which manages water imported to southeastern Colorado from the U.S. Bureau of Reclamation’s Fryingpan-Arkansas Project. The Fry-Ark is a transbasin diversion system with five reservoirs, including Pueblo. In the water world, storage lags precipitation for one year, so the robust water levels in the Fry-Ark system this year derived almost entirely from 2017’s wet winter. As with most reservoirs, users store different amounts of water and hold different dated storage rights that dictate whose water would go first if a spill became necessary. 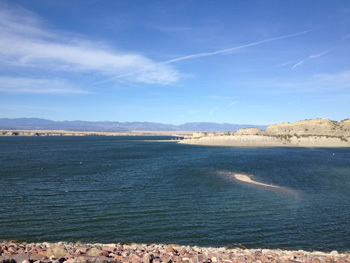 At Pueblo Reservoir, the City of Aurora would have been at the top of the list, followed by certain irrigators and some smaller communities, according to Chris Woodka, a spokesman for the Southeastern District. If the reservoir’s users hadn’t acted quickly, millions of gallons of imported water would have been spilled, merging with the Arkansas River’s native flows, available to downstream and out-of-state users who normally would have been blocked from tapping those flows. Instead, Aurora was able to sell some of its stored water to an irrigation company, and other irrigators took their water early to use for spring planting. All told, some 33,000 acre-feet of water was released and used, enough to serve 66,000 homes for one year, Woodka says. He credits irrigators with moving swiftly to avert the spill.